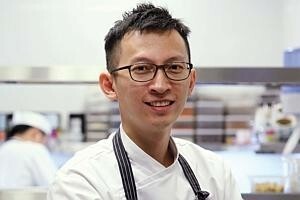 THE 36-year-old chef de cuisine of Ocean Restaurant in Resorts World Sentosa came in second at the Bocuse D'or Asian finals last month and will represent Singapore at the global finals in Lyon next January together with commis cook Aaron Wong, 21, who also took home the award for Best Commis Cook at last month's competition. Named after famed three-Michelin-starred French chef-founder Paul Bocuse, the biennial cooking championships for individual chefs was started in 1987 and is now considered the Oscars of the culinary world. Each country can field only one competitor, who have to present a fish and a meat course within five-and-a- half hours that will then be assessed by 12 international judges. A second-time competitor, Mr Yew topped the Asia finals last year and placed 17th in the global round. He says: "In the last Bocuse d'Or, we came in 17th place due to some confusion with the new rules and regulations for the fish plate. I wanted to compete again because I felt that we could do better now that we are fully aware of the criteria. The competition this year was tougher with teams stepping up their standards so my team and I had to fly into Shanghai a week earlier to source for fresh ingredients and conducted a dry run before the competition. "We have not begun our training for Lyon yet as we have not received details on the main ingredient we will be required to use, but when we do, we will train twice a week in the RWS' kitchen and increase it to thrice a week when we draw closer to the competition date. "The Bocuse d'Or is a good opportunity for chefs from diverse backgrounds to gather and bounce ideas off each other and learn what is happening in the international culinary scene. I work best under pressure and it has helped me grow as a chef by training me to think on my feet, and to become more detail-oriented and focused, which has translated into how I lead the culinary team at Ocean Restaurant. "Prestigious competitions such as the Bocuse d'Or are attended by many of the culinary heavyweights, so by having a Singaporean team present and competing, it helps to highlight the fact that a small island like ours has culinary talents and great potential. Singaporeans, too, are changing their perception gradually and now view being a chef as a viable career and hopefully a younger generation of chefs will be inspired to become culinary figures capable of taking Singapore onto the global stage." A SENIOR bartender at 28 Hong Kong Street, 26-year-old Mr Chua topped the South-east Asia finals of the Diageo Reserve World Class Competition in May, and was placed among the top six bartenders - out of 47 contestants - in the global finals held in the United Kingdom a fortnight ago. No rankings are given for the top six. Over the five-day finals that started in Edinburgh and stretched to London, Mr Chua had to undergo at least nine challenges that required him to, among others, create two cocktails inspired by Jack the Ripper and two more using ingredients bought from Borough Market. Besides the Top Six ranking, Mr Chua also topped the Zacapa Gastronomy Challenge, in which contestants had to craft cocktails to pair with food. He says: "Making it to the top six along with such great bartenders was a victory on its own! Winning the Zacapa Gastronomy Challenge was such an honour and privilege, and the real icing on the cake. "The intensity of the competition - sleeping an average of three to four hours a day, going through various challenges that tested the individual abilities of the bartender, doing interviews and being filmed every step of the way - was very taxing physically and mentally. But as a fellow competitor said, preparation for the competition began when I first started bartending: the knowledge and technique that I have learned throughout my career as a bartender has helped me prepare for each World Class Challenge. But I also made sure to allocate a few hours a day to practise my drinks and presentation. "Besides the personal achievement, I feel that being the first Singaporean to have made it to the top six is more significant for the bartending scene in Singapore as a whole. Thanks to the hard work of everyone who has been involved in raising the level of the craft locally, from the bartenders and spirit suppliers, to the international bar personalities who have travelled here to lend us their knowledge, as well as visionary bar owners, we're making waves internationally and making Singapore a country to keep an eye on." WHO knew - when this dimly-lit speakeasy first opened on KTV lounge and backpacker hostel-clad Hong Kong Street three years ago - that it would eventually go from being Singapore's worst kept secret to a leading luminary of the local F&B circle? Backed by American venture capitalists-turned-beverage geeks and fronted by a spirited team of youthful Singaporean bar talents, 28HKS now trains aspiring mixologists, consults on new bar set-ups around town, organises community-fostering bartending throw-downs every month, and supplies the scene with lesser known American craft spirits through its spin-off alcohol distribution company, Proof and Company. The bar consistently ranks on the industry-voted World's 50 Best Bars list (it came in 10th on the 2013 list and 42nd the year before) and was most recently named the Best International Bar at the Tales of the Cocktail awards, a notable five-day gathering of cocktail and spirits industry stalwarts held in New Orleans last month. The bar was also nominated in the Best Internatonal Bar Team and World's Best Bar categories, and bartender-in-residence Zdenek Kastanek was nominated for International Bartender of the Year at the awards for the third year running. Says 28 HongKong Street's director, Spencer Forhart: "We're a humble bunch so winning the title of Best International Bar was an amazing piece of recognition for all our hard work. "One of our core focuses at 28HKS is to be a platform for talent; we have a comprehensive programme designed to bring our team shoulder to shoulder with the best venues in the world, which consists of close mentorship, lots of practice and exposure to the international cocktail arena, and we're pleased to see the benefits this is having on the collective team and on the individuals. "Over the past three years the team has been fortunate enough to secure our position in many of the top bartending competitions around the world, which has provided a pathway for our bartenders to hone their craft and gain visibility within the industry. "If you look to New York or London, you see four drivers that work together [to build a leading bar scene]: great ingredients, a community of professionals treating bartending as a proper vocation and pushing each other to achieve, educated writers disseminating insight and knowledge, and discerning guests who care about what they eat and drink. "Each of the four aspects has improved dramatically in Singapore, and the world is now watching what's happening here due to the success that Singapore-based bartenders are having in competitions like Tales of the Cocktail and Diageo Reserve World Class. We should all be very proud."